Players are now on their dinner break. The board ran K 10 4 3 2 and Hellmuth scooped the pot, doubling him to 255,000 in chips. Hellmuth was trailing but found hope on a flop of 9 J 5 . The turn was the J and the tournament director announced that Hellmuth needed an 8 for a straight. Fittingly, the 8 fell on the river and Hellmuth scooped, doubling up to 270,000. The turn gave Hellmuth a flush draw, coming 7 , but the 6 river made sure that the pot was split. 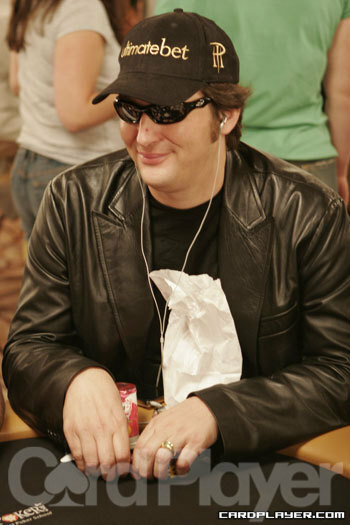 After the chop, Hellmuth remained short on chips, with around 100,000 in chips. The board gave Thomas a full house with no low, running J 9 K 4 4 . Hellmuth dropped to just 40,000 and was in serious trouble. Thomas saw her stack increase to 160,000. The turn brought the 7 and the 8 was enough to send Baker to the rail in 10th place, winning $14,544. And just minutes ago Barry Greenstein became the latest victim. The flop gave Baker the lead, running Q 9 2 . The 6 didn’t change anything on the turn and the Q river made it official — Barry Greenstein was gone in 12th place, earning $14,544. The board came K 10 10 A 2 , causing Thomas and Chappus to split the high with two pair, and with no low Sprengers got nothing and was eliminated in 11th place, winning $14,544. The cards are in the air for the final day of event No. 41 ($1,500 Pot-Limit Omaha 8 or Better). Still fighting among the remaining 15 players are Barry Greenstein and Phil Hellmuth. Will Greenstein win his fourth bracelet, will Hellmuth win a record-setting twelfth bracelet, or will one of the others rise to the top? Stay tuned to CardPlayer.com for hourly updates. The final 15 players remaining in event no. 41, the $1,500 pot-limit omaha 8 or better event will return to the Rio today at 2:30 p.m. to play down to a bracelet winner. The chip leader is Ryan Karp, but the real story lies in the players behind him. Phil Hellmuth and Barry Greenstein are both healthy in chips and looking for some more WSOP hardware to add to their collection. Young Ben Lamb is still in contention and so is veteran Tony Cousineau. The players are well within the money and at this point, each player is guaranteed $11,731, but the first place prize money of $245,871 will be awarded to somebody by the end of the day. The blinds will be 6,000-12,000 when they begin play and the average stack is 254,100. Check back with Card Player later today for updates on this event as we find out who our next lucky bracelet winner will be.